What does a Wah Pedal do? How does a Wah Pedal work? Every guitarist is looking for that sound. The perfect addition to their setup that makes their riffs and solos really stand out. A Wah Pedal is what you are looking for, and the difference it can make for your sound is astonishing. If you feel like your music is missing something that would really make it unique, then you should try to add this piece of equipment. It’s small and battery operated so you can take it virtually anywhere, to any performance. This addition has been popular for a while and used by so many famous guitarists. We have listed some of the best Wah pedals below. The ones that give the greatest and performance changing wah tones. Versatile and easy to operate, this wah pedal will make use and perfecting your wah tone a breeze. You’ll love the wide frequency range. With the red and yellow Fasel Inductor and various adjustable knobs, you can easily find the perfect sound to fit your performance. This one’s really study and tough. Beautiful to the eyes and ears, this wah pedal is sure to provide easy use with a wide arrangement of tune modifications and sounds. You’ll love the classic style it comes in. A tribute to Cliff Burton, this wah pedal has a collection of varying knobs and switches to perfectly mimic his sound or create your own. This is well known for its durability. Multifunctional and straightforward in design, this pedal allows you to easily create a beautifully altered and smooth sound. Modify it easily by tightening or loosening a screw. This Cry Baby Wah pedal is highly rated amongst guitarists. Praised for its range of wah effects and ability to adapt to different sounds, this wah pedal is sure to please. As you know, sound is everything in giving a powerful performance. Here’s the deal: this Cry Baby wah pedal offers the ability to span from a sharper to a broader wah effect. The larger silver dial on the side allows for easy access during performance, while the smaller dials help tune the wah effects to the exact sound that you want. There are even dials for volume and boost so you can play as loud as you want. Tone and sound are key to every performance that a guitarist gives. The different knobs and buttons on the sides of this wah pedal allow you to fine tune this piece of equipment to the perfect sound that you need. It gets better: It includes a red and yellow Fasel Inductor to provide two very different distinct sounds, thus offering an even wider range of wah effects and tones. Plus, the light that the LEDs on this wah pedal are vivid and bright. Perfect for performances in darker and more livelier places. If you are looking for more of a classically styled piece of equipment to fit your image or music, this wah pedal is it. Designed with LED lights, control knobs to adjust bass, treble, wah-Q, and bias, this is one of the best wah pedals on the market. In addition to those features, it also comes with a True Bypass. This creates even more different effects to your sound, like making it clearer or more distorted in the way that you want it to be. Also, the smaller size of this piece of equipment allows it to be an effortless addition to your music. This wah pedal version is a tribute to Cliff Burton, the original bassist for Metallica, so if you love his powerful sound, you would really enjoy this. Powered by either a single 9v battery or Morley adapter, this wah pedal provides a wide range of wah tones. 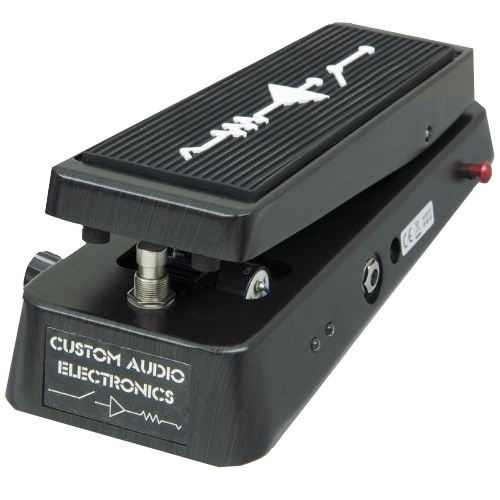 Now, this wah pedal has a variety of switches and knobs to adjust your sound. There is a switch to vary the sound from Vintage to Modern, a knob to increase/decrease the intensity with a LED indicator. This steel wah pedal is sure to last through years of use. This is a simple, yet reliable and durable expression pedal to have. It comes with a 6.5’ cable that you can replace with your own cables to fit your different setups. Connected to different instruments, this pedal creates an altered sound that you can adjust to your liking. The pedal can be modified by tightening or loosening a screw on the side to level the pedal to how you play. Thus creating a smooth performance from the equipment with just the right amount of the tension that you need. A wah pedal is the most common stompbox used by guitarist today. It allows you as a musician to modify the tone of your electric guitar. With a simple rocking plate that you control with your foot, you can make a range of sounds from high to low. By using a wah pedal, you are adding a unique twist to your music. The best part is they are fairly easy to use when first starting out. As soon as you flip the switch on, the pedal can easily deliver that beloved ‘wah wah’ sound. The wah pedal is loved by guitarist and is used in all genres to create distinct sounds and grab the audience's attention. As far as sound goes, a wah pedal changes the tone of your guitar as you move the foot pedal from up to down. But how exactly does it do that? The wah pedal is essentially a filter that works as a movable peak through your signals EQ. This is what allows you to drastically change tones from low and brassy to high and narrow within seconds. If you want to get more specific, the pedal works by engaging a bandpass filter that resonates with its low-pass, roll-off frequency. The foot pedal allows the guitarist to deliver that ‘wah wah’ sound by changing the frequency of the resonating peak. In order to produce the most natural and wide-ranged sounds, it is important to place your wah pedal in the correct place. The pedal should typically be placed early in your pedal chain, in order for your wah to alter your signals before distortion and overdrive. However, placement of your wah pedal also depends on the type of music you are producing. Placing it late in your chain will create very exaggerated wah tones, which isn’t a bad thing if you are going for more psychedelic and funky sounds. There are a lot of awesome wah pedals on the market. So when choosing one, it is important to find the features that are most important to you and your music style. The most basic wah pedals come with a simple on/off button and no tweakable controls, however, they still get the job done and deliver that legendary wah wah sound. So, we have gone through what a wah pedal can do and how they create sounds, but how exactly do you use one? Before buying a wah pedal, it is important to fully understand the process so you can get the most out of your purchase. There are two basic positions when using the pedal: Open position (heel to ground) and Closed position (toe to ground). When you use the open foot position, you can produce lower pitches, while the closed position adds treble to your tone. When you slowly rock the pedal back and forth, you will hear a subtle sweeping sound. The faster you move your foot, the more intense your sounds will become. As you do these motions, you will begin to hear a ‘wah wah’ sound, hence the name wah pedal. With every position, you have a wide range of different potential tones. However, instead of moving the pedal back and forth, many guitarists leave it on a specific spot. This is a popular technique among musicians because they simply use their wah pedal as a filter to add some flavor to their desired sound. The wah sweep is another technique popular among musicians. By moving the pedal back and forth slowly, you can make a soft sweeping sound. This gradual change in tone can work well with many rhymes and create some awesome, more soothing sounds. The funk rhythm is a bit trickier than the other techniques we talked about. It is similar to the original wah wah technique that simply requires you to rock the pedal back and forth. But instead of rocking it to the note, you must continue to move the pedal to the beat even if it doesn’t fit the rhythm. This can throw a lot of guitarists off since they are used to playing and rocking to the beat. But with time and practice, you can master this technique to create some seriously intricate rhythms. With so many great Wah Pedals on the market, it is important to look at each one's unique qualities. You might be content with a very simple pedal, while others might search for a wah pedal with many additional features. Once you have figured out everything you want out of your wah, you should research, compare, and try out in person to find the one that makes you most confident in your sound. But no matter your style or preference, there is a wah pedal for you. And it will provide that special spark every artist strives for in their music.